Thank you for coming back for part 3 of the kitchen remodel series. As you'll recall, I've updated the flooring with some inexpensive peel and stick vinyl tile, changed out all the pulls on the cabinets and drawers and started dreaming of bigger changes. As I mentioned in the last post, a job fell into my lap so I worked a few hours, stashed away some cash and started dreaming of bigger changes. I know what you're saying, "Holy moly, that must be SOME job to make enough for a whole new kitchen in just a couple of months in your spare time." Wellllll, ok, it's not a whole new kitchen but it'll look like one when I'm finished. The first thing I did was head off to Home Depot to wander the aisles kid-free. Yes, I left O with the hubs and headed out on a fact finding mission. I priced plywood, trim, beadboard and everything else I passed along the way as my mind spun out of control with ideas. Finally I wandered into the kitchen showroom area and really examined all the different styles. I asked one of the guys sitting at the desk what he thought about my design options based on the size of our kitchen and style of our home. He pointed out some great pros and cons of the different options I was looking at and ultimately I settled on just adding a frame around each door to give it some architectural interest. I returned to the show kitchen with this same detail and studied up. I headed back home to ponder as I often do with larger projects and over the next few days I realized that I couldn't purchase pre-cut trim because the trim on my drawers would have to be narrower than the trim on the cabinet doors or the proportion would be all wrong. In the end, I opted to purchase a sheet of 1/8 inch thick plywood and cut the strips for the trim on my own. I cut 2 inch as well as 1 1/4 inch strips. I started with one double-door freestanding upper cabinet to give myself a good inspiration piece. I took off the cabinet door, glued down custom trim to the face of it, routered it, sanded it, primed it, painted it and voila! the first door was done. As I said, I took down the first cabinet door and started working on it (rough workspace eh?). I'm not going to lie, even I was shocked at how amazing the transformation was. I'll never forget that feeling when I realized that they actually looked good enough that this might not be a temporary fix until we can pay someone else thousands of dollars to redo it in a few years. We might actually be content with this kitchen indefinitely. I had a hard time getting to sleep that night as I dreamed of what the kitchen might look like at the end of the project. I also learned a few lessons along the way and knew I had my hands full on this one. WOW! That is quite the transformation. They look awesome! I came over from MMS. I am working on a kitchen remodel and this insired me! 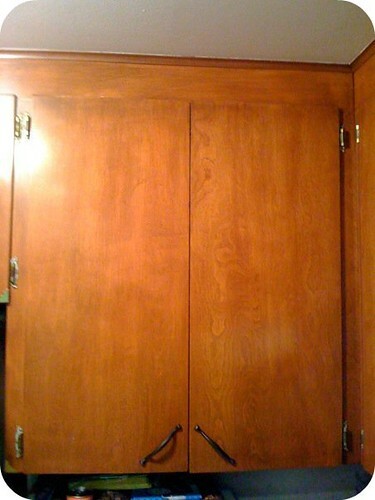 I have super similar kitchen cabinets that I plan on doing the same thing to. These look great but I only have one concern and question. After adding the bulk via addition pieces to make them shaker did you have any trouble with opening or closing? What adhesive did you use to add the trim? It was some sort of construction grade adhesive that I had to use a caulking gun to apply. I'm sorry I don't remember more, as I recall, it was something I happened to have on hand. I did have to press and wiggle the pieces into place to smear the glue around and then I clamped although once I started using my nail gun in addition to the glue, I don't think I had to clamp anymore. Regardless, even with the humidity of a poorly ventilated kitchen (I hate that noisy old hood so I rarely use it), none of the cabinet doors are showing any signs of coming apart. Where did you find 1/8" thick plywood? smallest I've seen is 1/4"
Sorry I can't be more certain. This is beautiful! I am thinking strongly about updating my kitchen cabinets this way. How to the sides of these cabinets look? 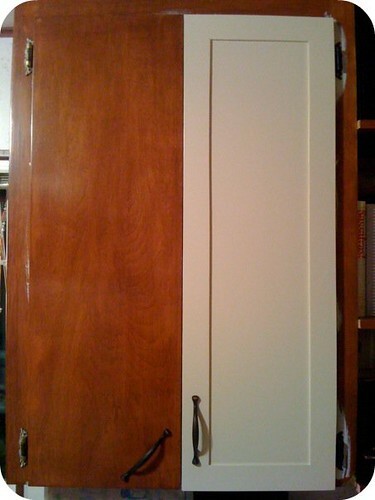 Did you have to fill any gaps where the plywood meets the cabinet? Do it!! It definitely took a few weeks to get it all done but I was mostly working on the weekends with a few minutes of stolen time during the kiddo's naps here and there. The sides looked great. If I recall correctly, I did have to fill a bit but I think it was more filling where there were gaps in the plywood (you know, a middle ply had a hole/knot). When I put the trim on, it wasn't always perfectly even because I'm not very good at cutting long pieces of plywood. I remember having to use my router to shore up the edges. My router has a bit with a guide that could run along the edge of the cabinet and shave off anything of the trim that hung over at all. It's a pretty common bit. I'm a huge fan of wood filler though, for better or worse (not sure if that makes me a bad carpenter) so if in doubt, use filler. I don't think I needed much though. 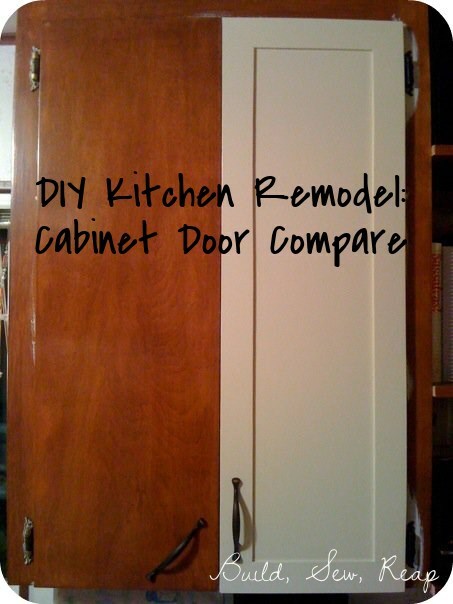 Were the edges of your original cabinets slightly rounded? I would love to do this to my doors, they have rounded edges - do you just put the new wood up to the edge and fill the gap? The corners of my cabinets were not slightly rounded. I'm not sure how you could fix that either. My first thought was that you could do the frames as I did and then use a router to make the frame edges match the original cabinet doors but I'm not positive that would look good. Rounded corners with the rectangular frames might not jive. You could try making a template and cutting out corners that you could glue on maybe? or cut new cabinet doors out of something like MDF which is what I did when I built a new cabinet and added it in next to the fridge. I wish I had better/easier ideas for you. Don't give up and if you come up with a good solution, please come tell me what you did here on this post. I'm sure others have the same challenge. Where did you use the 2 inch and 1 1/14 inch strips? Horizontal, vertical, or on drawers? Kitchen looks great! The 2 inch strips were used for all the door parts as well as the vertical parts of the drawers. The smaller strips were for the horizontal parts on the drawers. I can't remember what the angle was but please keep in mind the drawer cuts weren't 45 degrees due to the different width strips. Love it ! 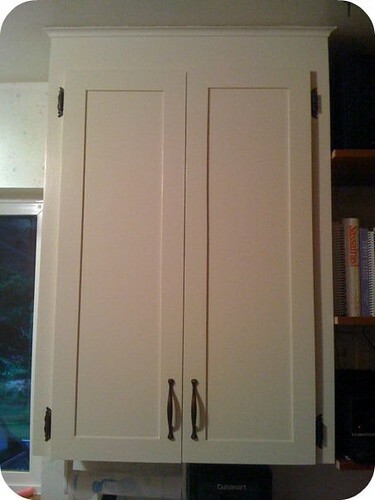 This is exactly what I have been planning to do to my cabinets as they are exactly like yours only white already ! So you said that you router them? How, and why? are my questions to you? 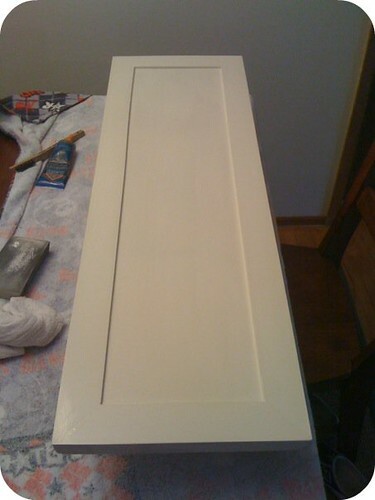 Hi Jeannee - I routed the edges after adding the trim to make sure they were exactly flush with the original cabinet doors. That's probably not necessary if you cut perfectly straight trim pieces (or buy them) but apparently at the time, my cutting skills were lacking and despite all my clamping and marking and guide setting, my edges weren't perfect. I ended up just letting them hang over a bit then used my router with the bit that has a roller that rolls along one edge and then a cutter that cuts the other edge to exactly match the first edge. Does that make sense? It may not be necessary if you're more precise from the start. My cabinets are formica type facings. Do you think the nail gun will cause a crack in the formica when attaching the trim? Also, what else do I need to take into account when painting over the formica? 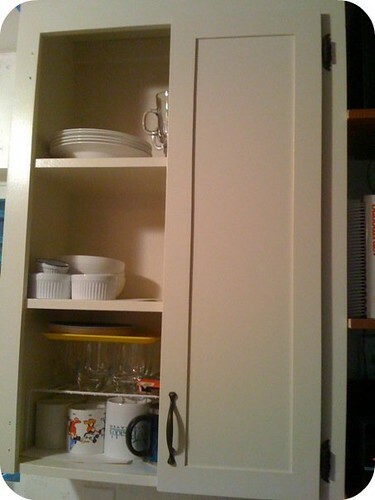 I love this, this is exactly what I want to do to update my cupboards, glad t know it is possible and it looks so good. Thanks for sharing, how wide are your trim pieces? Thanks for this great idea...i'd had a similar idea with a strangely matching original cabinet set up to yours! Must have been a big run on this type of cabinet back in the day...love the look you've created and thanks for the inspiration to just do it! Looks like you did angle the corners of your door front trim if I am seeing it correctly, right? Do you think we could do that with our kitchen ? Picture above. Ours is so flat. I think it would add more demention. Hi Nicole - I totally think you could update yours like this. Be mindful of how the new trim might interfere with the hinges but I think it would look great. Here's another one that shows how flat it is. Very creative and effective. However, there is only 1 photo of the process and its from a distance. All the other photos were before starting or after it's done. Thanks! Thanks so much for this post, which is really great. 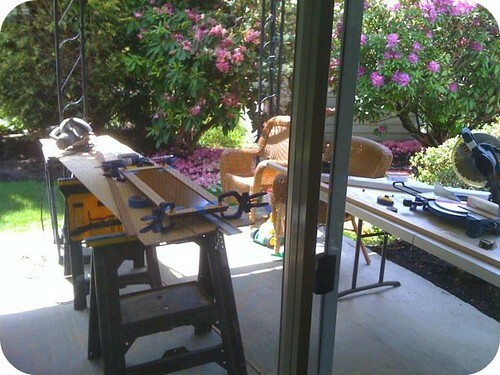 I'm just about to start doing this in my kitchen, but have inset doors so need to use thin ply. Most bloggers seem to use 1/4", but you say you've used 1/8", which is what I need to use. Are you sure it 1/8"?? It looks even better than the doors I've seen with 1/4"! I hope this is right. So excited!! Thanks so much - your kitchen looks fantastic and very inspiring! Do you have a picture of your drawers? I'm just trying to get an idea of different widths on drawers and would like to see the 1 1/4". Your kitchen looks great. I have an 80's Melamime kitchen presently and going to basically do this same technique to my flat doors to add dimension. Really a amazing post....excellent works. Thanks for sharing..
Our stone countertops and custom cabinetry make your kitchens the most beautiful heart of every home. We also sell and install the countertops all around Manitoba.